As I mentioned before, I closed my ebay store "Jens Scrubs N Stuff". Since I really HATE that name I want to change my store's name all together, something shorter. I started with that name at ebay because I was only making scrub tops & auctioning non-handmade stuff. Then, since I wanted to branch out, I opened everything else with that name. At etsy my user ID is Jenni4 not realizing that would be my store's name, I thought it would just be my user ID like at ebay. Oh well, not a big deal...I plan to keep jensscrubsnstuff.com for a year since I have pens & business cards out there floating around but I would like to get a new domain & change my store's name to something I like. ****I would love some suggestions for a new store name (which will be my new domain) from anyone. 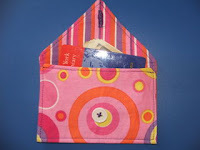 I sew, & I make bags, embroider, nurses uniforms (scrub tops), wallets....well you can check out my store http://jenni4.etsy.com/ & I'm sure I'll be adding all sorts of sewn stuff in the future so I want a name that will allow that. Guess I should stop and go back to work, huh? Good luck with this, hunny! You've got some really good suggestions so far! ??? Okay, that's all I got! Lol. Read your profile about your puppies.